© Herman Miller. Photograph by R. H. Hensleigh and Tim Thayer. Gift of Herman Miller, Inc. Architect, writer, and designer George Nelson was one of the pioneers of postwar design in America. Made Herman Miller’s first Director of Design in 1946, Nelson felt strongly that innovative design was needed to replace the impractical revival furnishings that appeared in most postwar homes. 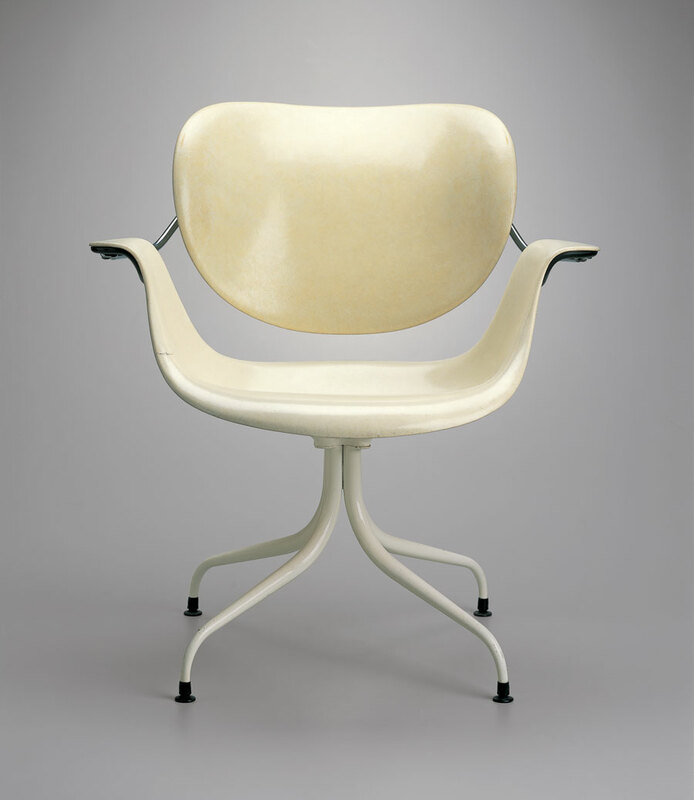 He continued the work of Gilbert Rohde, the first designer at Herman Miller to create modern objects, and enabled the company to become a forerunner in the creation and dissemination of modern industrial design. Under his leadership, Herman Miller employed forward-thinking designers whose experiments with material and form shaped what was, and still is, contemporary design. This molded plastic chair formed part of a collection of tables and chairs called the “Swaged Leg Group.” Nelson combined Charles Eames’s design for shock-mounted connectors with flexible joins to make this ergonomic chair comfortable and able to flex with the sitter’s movements. Typical of Nelson’s work, it uses inexpensive yet innovative materials to create an object that is as beautiful as it is useful.